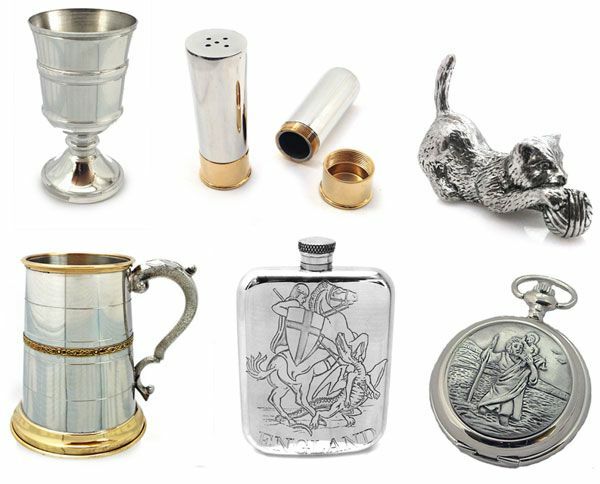 Pewter is a metal alloy traditionally made up of 85-99% tin. The remainder made up of copper, antimony, bismuth and occasionally silver which act as hardeners. Until recent years lead was commonly used with the tin, but due to the now known health effects, lead is only used for decorative items and never items that might come into regular contact with the body. All our pewter items are Lead Free. Pewter can trace its origins back to the ancient world with both the Egyptians and Romans using it widely. It’s a soft malleable metal with a low boiling point making it an easy to use and popular metal for craftsman. Gold Jewellery won't tarnish or corrode. However, with regular wear, your gold jewellery will eventually accumulate a film of soap, body oils and grease. For a light clean of untarnished silver or gold, use phosphate-free detergent or non - abrasive cloth made for cleaning jewellery - these cloths should come with built in jewellery cleaner. Remove Jewellery before showering, swimming, bathing or household cleaning. Cleaning your jewellery regularly can keep it looking its best, but be careful. For best results purchase commercial cleaners fro ma jeweller, DO NOT use bleach a sit can literally destroy the piece, so avoid it at all costs.